Chili is something that kids do not always like. Many times I hear people saying that their kids do not like chili. Not sure if maybe it is made too spicy for them or whatever the reason, but it is not always a child’s favorite. 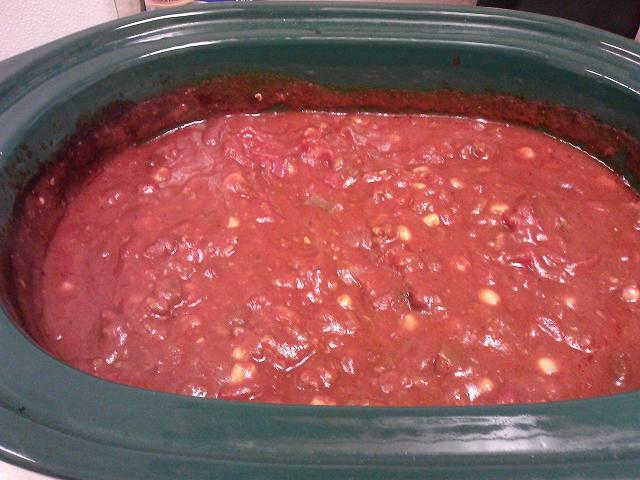 In our house, everybody looks forward to chili for dinner – yup even the kids! You can make this on the stove also on low to medium low, but I prefer to use the crockpot. I used to really like it spicy (and still do add hot sauce to my own bowl), but I have learned a great way to make it taste great without too much spice for the rest of the family. If you are into the real spicy chili, you will want to add more crushed peppers or diced hot peppers to this, it is not a very spicy recipe as it is. And even tho you will be adding crushed red peppers (which alone are a little spicy), I promise this will not be too spicy for anybody. Do not leave out the crushed peppers as they do give it a nice flavor. Plug in your crockpot and get ready to start dinner – it will be ready in about 6 hours if cooked on high. Take note that this makes a lot of chili, but you can always freeze it or use it for a couple meals during the week. Cook the ground meat in a skillet before adding to the crockpot so it doesn’t get all the grease into dinner. In a small bowl combine the chili seasoning ingredients. Once meat is cooked, drain and put it in the crockpot. Then add all other ingredients including the seasoning and stir well. Put the lid on and cook for about 6 hours on high. If you need to keep it on a little longer, you can drop it to low after the 6 hours to keep it warm. I often make the homemade bread, but the Pillsbury dinner biscuits are also good with it.